For the environment, one of the scariest things about Halloween is all of the waste that comes along with it. Plastic decorations, vinyl masks, pumpkin containers and costumes create frightening amounts of avoidable waste. According to the Retail Council of Canada, the average Canadian household with children plans to spend an average of $75 on Halloween purchases. With all that consumption comes a large eco- footprint with a lot of waste. Be creative and make your own costume. You can always find great Halloween costumes by searching through your craft or toy bins. Some people may have capes, firefighter hats, tiaras, wands, doctor kits, fairy wings, and jewelry that can all be used to create a one of a kind costume. Eye patches can be used for a pirate costume, and playing cards and magic tricks can be used for a magician. The possibilities are endless! Go natural with Halloween make up. Make your own blood, bruises, and dyed hair with kitchen ingredients like flour, corn starch, syrup, and food coloring. Say no to vinyl masks and fake teeth. These plastics may contain lead and phthalates. Now that’s scary! Look for second hand costumes at your local thrift store. They will be cheaper than buying them at full-price. Renting a costume is a great idea! You can have a new costume every year and you won’t be creating waste! If you do buy a new costume, choose one made from natural, non-toxic materials, such as organic cotton, wool, silk or hemp. Choose well-made costumes that can be used again and again – whether by a sibling or another child. When you are done with your Halloween costumes, you can donate them to your local thrift store or sell it on Kijiji or Craig’s list. Don’t forget about treat bags. Create reusable treat bags this Halloween by taking old pillowcases and let the children decorate their bag with paint, glitter, and any other craft supplies you can find around the house. Even better – you can reuse them next year! Decorating your home this Halloween? 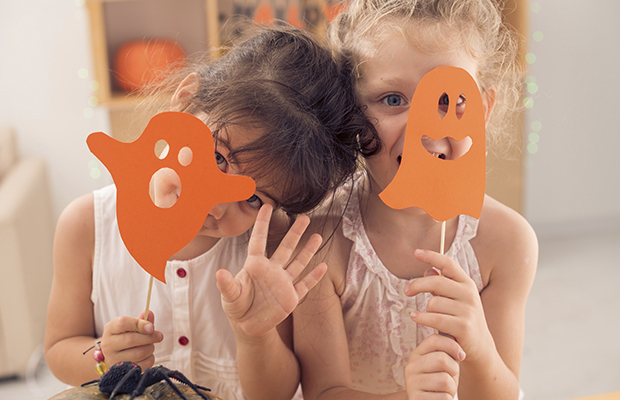 In the same spirit as your Halloween costumes, create your own Halloween decorations! Pull out the craft supplies and your recycling bin and get to work. Recycled egg cartons and cans are great for making bats and spiders (paint the cups black, push black pipe cleaners through the “bodies” and add spooky eyes). Cut gravestones from cardboard or create spider webs from yarn or string. Decorate with bare branches, dry leaves and pumpkins. The best part is all of these decorations can be composted after Halloween!